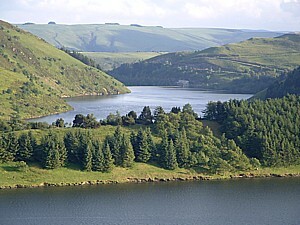 The Llyn Clywedog near Llanidloes, Mid Wales is a man made reservoir. The water is held back via the impressive Clywedog Dam (the structure is the tallest mass concrete dam in Britain) , with is main purpose being a water controller for the River Servern. It holds back some 11,000 million gallons of water. The reservoir offers some of the best fly fishing in Wales. I have fished by boat and on the bank, both can be very successful. The scenery is stunning and is the most picturesque venue I have ever fished. Early morning and late evening you can hear the trout rising in the distance. Boat Permits are available from Woosnam & Davies Newsagents Tel 01686 412263. Tickets cannot be purchased from the resevior.